July 22, 2015: Hello, there! Chester Monday here. Most of our reading, so far, has had to do with medieval Europe, not a secondary world. Well, that's about to change. Aside from the array of books and articles we'll review, we'll be drawing maps that should eventually be seen here. First, though, I thought I'd check with "M" on a few preliminary rules (if you really can impose rules on a project like this). Chester: Our outline of the Children's Crusade came mainly from Gray's book, and our information on the Dancing Manias came mostly from Hecker's account. Now, however, we'll be expanding our library. M: That's true. Legends of mysterious lands are found everywhere, but, because they are mysterious, most books can only find enough material for a chapter or two. We will catch glimpses of the Other World in Myths of the Cherokee, The Leprechaun's Kingdom, Lost Continents, and Charles Fort. We will argue from the general -- that is, countries and continents -- down to the specific, many details about a single small area. C: You told me you had some sort of philosophy concerning the geography of the Secondary World. M: Once I was old enough to understand the concept, I decided the Other World lay in a parallel universe. It is about the same size as the earth, it has a sun and moon much like ours, similar oceans, atmosphere, flora and fauna. It is not an alternate world, which would mean it and earth "branched" from one timeline. Its continents and seas are different, and the only reason humans and earthly animals live there is because they have passed from our earth to that one. C: Excuse the interruption, but -- you say when you were old enough to understand the concept? M: I didn't understand "other dimensions" when I was a kid. I couldn't get through A Wrinkle in Time at all, with those Tesseracts. But an interest in math -- and science fiction -- and a few Fantastic Four comics -- taught me the concept. Anyway, earth and the Other World inhabit the same space, on different dimensional planes. Each point there corresponds to one point here. My major rule for mapping the Other World was, anyone popping over from one world to another would land in the appropriately corresponding place. That is, if you pass over from Hamlin, Germany, today, you'd appear where the children of Hamlin popped up in 1284. This is almost the opposite of, say, the 1970s show Land of the Lost. The Land of the Lost was a tiny bubble universe, so it couldn't correspond point-by-point to earth to begin with. People and creatures appeared there from anywhere in time and space: dinosaurs, aliens, Civil War soldiers, an ancient Greek Gorgon -- they all appeared in more-or-less the same area at more-or-less the same time. C: Fantasy purists might say that parallel worlds and bubble universes sound science-fictional. M: This is all behind-the-scenes work. The people and creatures of the Other World don't know all this, at least not in those terms. Like many writers, I often tried to stick too much back story into a tale -- outlining, for instance, the whole Children's Crusade/Piper/Dancing Mania thing in a novel where none of it makes an impact on the characters. I'll force it on -- I mean, reveal it to -- the world at large here, on the Fantasy World Project. And I may put too much thought into the "dimensional" stuff: I actually wondered why there would happen to be two worlds in the same "place" in two different dimensions, if there were no connection between the universes. I came up with a pseudo-scientific theory that some aspect of gravity "leaks" between universes, causing worlds and suns to accrete in the corresponding points. I was happy to read an interview (Discover magazine July 2006) with physicist Lisa Randall, who theorizes: "Gravity can spread out anywhere, so it really is different [from other forces]. It can leak out a little into extra dimensions. That can explain why gravity is so weak compared with the other forces." C: Overthinking things, huh? Well, this whole project smacks of obsession. But I mean that in a good way. Do you have any other rules for the Other World? M: I'd say time runs the same here as there. That is, the "Pied Piper" sequence occurred over eight hundred years ago there as well as here. Many fantasy worlds have it that time for them runs at different speeds, such as Narnia. I might make an exception for all those fairy legends of a hundred years passing like a single night. That would be the fairies' doing, however, not the set-up of the Fantasy World. Finally, I tried to downplay certain themes: dragons, time-travel, ghosts, and over-the-top "Monty Haul" magic. Not a rule, exactly, as anything might happen in the Other World. C: So, same size as earth, and it corresponds point-by-point and history-wise to earth. Kind of simple, actually. Now, how would you start mapping it? M: All peoples have their legends of fantastic lands, and they can say, however vaguely, where those lands are. And if you travel to those spots and do not find them, perhaps they lie on the corresponding points in the Other World. And the most informative source of places that aren't may well be No Longer on the Map by Raymond H. Ramsey. No Longer on the Map, Chapter One: The origin of "El Dorado" is known quite specifically. The Muysca tribe of South America celebrated the installation of a new chief by covering the man in question in gold dust and tossing a few gold baubles into a lake. The new chief would dive into the lake to wash off the gold, then everyone would go home. Only in the Conquistadors' imagination was this ever a "city of gold," so it was not a proper name of myth or legend. In 1584, however, a man named Antonio de Berreo explored the Orinoco River area and heard a "real" legend from the natives: "There was, de Barreo learned, a great lake called the Parima somewhere southeast of the Orinoco, and on its shore a gold-rich city called Manoa." (p. 13) Obviously, the Spaniards never found Manoa either, but this seems like a genuine candidate for the fantasy world. On the blank map, south of where the Orinoco River should be, let's draw in a lake, Parima, and Manoa, "the greatest city in the world." 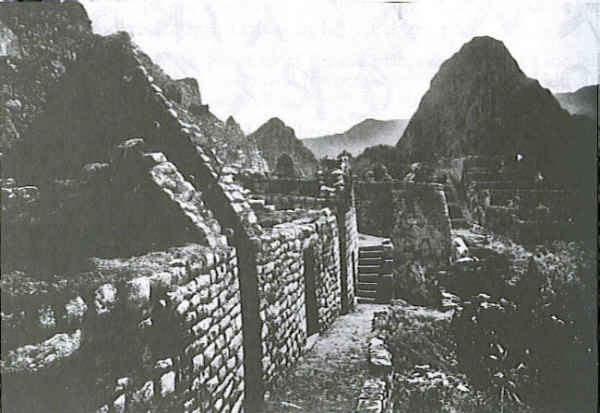 From here Harold Wilkins' Secret Cities and Mysteries of Ancient South America, as well as Percy Fawcett, ought to be good for wacky ideas. Books on South American religion and mythology, such as The Shaman and the Jaguar by G. Reichel-Dolmatoff and the Villas Boas brothers' Xingu: the Indians and Their Myths would fill the land with strange gods and creatures. In Chapter Two, "Terra Australis Quasi Cognita," we learn of the Greek idea of symmetrical land masses. “Oikoumene” was the “known world," Europe, Africa, and Asia. The Greco-Roman geographers decided there were three other main land masses on earth to "balance" the quarter of the globe holding the Known World: Antoikos to the south, the Antipodes opposite them in the northern hemisphere, and Antichthones to the south of Antipodes. As the Fantasy World slowly forms, a single large landmass looks good about where Europe, Asia, and part of Africa sit on earth. It should be named "Oikoumene", but that is such a jawbreaker of a word, I think I'll return to that later. The main focus of Chapter Two is the Unknown Southern Continent, first described by Ptolemy. The idea of Terra Australis developed without any knowledge of the actual continent of Antarctica (or Australia, for that matter). 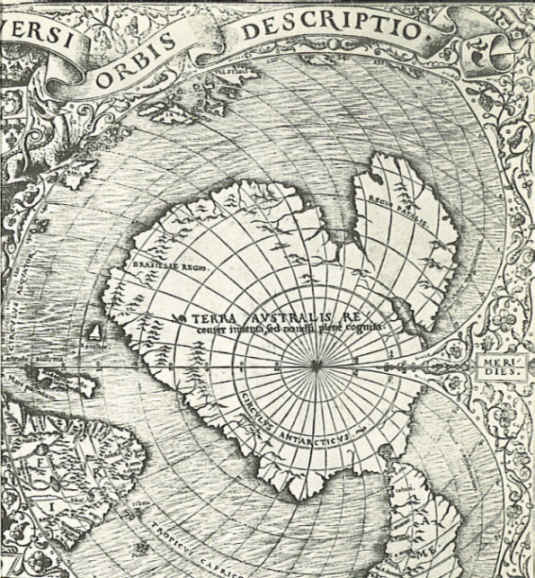 In the Middle Ages cartographers depicted it as a truly extensive landmass, far larger than the real Antarctica. Abraham Ortelius' Theatrum Orbis Terrarum of 1571 gave all sorts of "information" about the Southern Continent: offshore islands, capes, the "River of Islands" and the "Sweetest River," and a "Land of Parrots" south of Africa. Most maps of the Southern Land had some sort of peninsula reaching far north. Some thought the "tip" was Ceylon or New Guinea. Ortelus' map shows this peninsula south of Java, divided into areas called Lucach, Beach (pronounced Bay-ahk), and Maletur. These names, writes Ramsey, were "apparently pure flights of fancy." Ortelius' map will at least be a starting point. One more old map may be of interest: that of Philippe Buache (1754), which splits the southern land in half with a sea called the Mer Glaciale. Actually, the split is about 80/20, the smaller chunk being an oval of an island following the 60th parallel, with its western end just south of Tierra del Fuego. It looks startlingly different from Antarctica. We may use this as the basis of the Southern Continent on out Fantasy World map. From here R. A. Skelton's Explorer's Maps (1958) and Hapgood's Maps of the Ancient Sea Kings look good. Allan and Delair's When the Earth Nearly Died continues Hapgood's theories. Ramsay refers to Lands Beyond by Willy Ley and L. Sprague de Camp and various books of exploration. Chester: I think I'm catching on now. As with the maps we're drawing, with tracing paper over real terrestrial maps, the Secondary World is like an overlay on our earth. M: That's it, all right. We go to where Manoa and Parima are supposed to be; they aren't there -- on this earth. They are present in the Other World. So we draw it on our tracing paper. C: Sounds like we're beginning a slow process of filling in the map. The whole world, in fact. M: Well, the Southern Continent takes up quite a bit of the globe. C: Are you using old maps as part of your world creation? M: The cartographers of the Age of Exploration had marvelous imaginations when it came to filling in empty spaces. I can always argue that people have "fallen in" to the Other World and returned with one of their maps, which was incorporated with a medieval map. C: Sounds like the story of the Piri Reis map, the one some people think was drawn by Atlanteans or Ancient Astronauts. M: And its shorelines, outdated since the Ice Age, were drawn onto medieval maps. Yes, I had that in mind. C: Are we continuing with Ramsey? M: We'll get back to him. First, however, I wanted to address the "oikoumene" problem. I think the main landmass of the Secondary World will be the equivalent of Europe and Asia (which, truthfully, form a single continent). The problem was, everybody in Eurasia had names for mysterious lands elsewhere -- they never needed a name for a "parallel" Eurasia. C: Except Oikoumene for the Greeks. That is a bit much. Middle-Earth, Oz, Nehwon, Barsoom -- and Oikoumene? Not going to work. M: My thoughts exactly. So I decided early on that the main setting for our fantasy tales, the main continent of the Other World, needed a better name. C: And did you find one? Toward the end of the year 1850, a stranger, or I should say a "mysterious stranger," was found wandering in a village near Frankfort-on-the-Oder. How he got there, nobody knew. See the Athenaeum, April 15, 1851 . . . The man was taken to Frankfort where he told his story, or where, to pose as a linguist, somebody told one for him. It was told that his name was Joseph Vorin, and that he had come from Laxaria. Laxaria is in Sakria, and Sakria is far from Europe -- "beyond vast oceans." I first read of Herr Vorin of Sakria in a cheap paperback version of LO! Naturally, once I started college, I had to look for this strange reference at the university library. Unfortunately, there was no issue of the British journal Athenaeum published on April 15, 1851, but a bit of nosing around showed that Fort meant the issue of April 5. On page 384 of that dusty old journal I read of the mystery of the "new man." "The story -- as we find it related in Correspondenz of Berlin -- attests that a stranger was picked up at the end of last year in a small village of the district of Lebas, near Frankfort-on-the-Oder, whither he had wandered no one could tell whence." The stranger, who spoke German "imperfectly", was taken to Frankfort. "On being questioned by the burgomeister of that enlightened city, the stranger said his name was Jophar Vorin, and that he came from a country called Laxaria, situated in the portion of the world called Sakria." I have no idea what happened to this "Jophar Vorin;" curious stories like this so often appear and then hang in the air forever without resolution. Still, we have some fun names for the Fantasy World Project. The main continent is Sakria, and some of the major regions of that continent are Laxaria, Abramia, and Ispatia. Chester: Hah! Now this smacks of obsession! Most people would have stopped with Fort. A few intrepid souls might have ventured to the Athenaeum -- if they could find the volume for 1851 anywhere. But even they would have given up, once they saw there was no April 15 issue! You slogged onward, regardless! M: Sometimes I think these things are hidden throughout history for me to find, if I just stick to it. I've noticed a lot of poor "transfer of information" in references that I've actually hunted down. Here, for instance, the journal date is wrong, and the mystery man called himself Jophar, not Joseph. Charles Fort nearly read himself blind perusing the world's journals and newspapers, scribbling barely-legible notes on slips of paper as he did so, so I guess we can forgive him. I like the alien sound of "Jophar" as opposed to the common Joseph. Perhaps, along with strange lands, we'll catch glimpses of the Other World's culture in our ramblings. C: Our mystery man appeared in Germany and spoke "broken German." I'm sure you liked that as much as his continent and country names. M: If the Piper colonized the Other World -- or Sakria, for now -- with children from Hamlin and the Crusade, then their descendants might speak a "broken German," altered over centuries. C: Because time passes there as here, right? Nearly six hundred years from the Piper's time. M: Yes. I've always kept an eye on legends, myths, and historical oddities in Germany and France, because the Fantasy World must lap over into those countries occasionally. Besides Herr Vorin, we'll read about Benjamin Bathurst and Kaspar Hauser. C: Well, back to our mapping. We can write a huge "Sakria" over Eurasia, and place "Laxaria", "Ispatia", and "Abramia" around it, like orbiting satellites. M: We'll become more specific later. C: What about the reference to Laxaria being beyond vast oceans, not in a parallel world? M: Vorin probably did not understand where he was or how he got there, only that he was far from home. There was also the problem of communication. I'll say the statements were metaphorical. C: You act like you believe him. M: For all I know there was no such person, or he might have been a fraud or a lunatic. We'll accept all sorts of mythical places and creatures into the Secondary World and speak of them as if they were real. C: Well. Beyond the ill-defined Sakria, we have an ill-defined Terra Australis and Manoa and its lake. My D&D maps have more than that. M: Then we must press on to more of Ramsey. No Longer on the Map, Chapter Three: The tale of the Zeno Narrative is quite fascinating, with its layers of strange names. First Nicolo Zeno landed on "Frisland", somewhere in the northern seas; he helped the ruler of that land, "Zchmni", subjugate "Estlanda" nearby; then he sailed to "Engroenland" to the northwest. He died, but his brother Antonio, who had come to "Frisland" at his behest, took up the narrative. He writes that a fisherman was brought before "Zchmni" because of his own adventures. The fisherman's ship had been blown across the Atlantic to "Estotiland", where the people knew Latin and traded gold and beer with Greenland. Then the fisherman sailed with the Estotilanders south to "Drogeo", whose savage inhabitants killed all but the fisherman, who was spared because he taught them how to use nets. The fisherman finally escaped back to Estotiland and from there to Frisland. Then Antonio and Zchmni sailed in search of Estotiland and, after a storm, found themselves on an island south of Iceland and west of Ireland called Icaria by the inhabitants. Oddly enough, most of this can be explained. "Frisland" was the Faeroes north of Scotland, and "Zchmni" was Henry Sinclair, Earl of Orkney. "Estlanda" was the Shetland Islands. "Engroenland" was Greenland. Ramsey dismisses the fisherman's "Estotiland" and "Drogeo" as fantasy because nothing in North America matches the description. Yet possibly Sinclair and Antonio Zeno reached America while searching for it, perhaps producing the rock carving of a Scottish knight near Westford, Massachusetts. Icaria, also known as Fishland and West England, may touch upon reality. It sat exactly where an island called Buss was reported centuries later -- then people reported only a rock -- then shallows -- then deep water. It may have sunk in modern times. All the above is interesting, and certainly it's the fodder for future stories, but it doesn't really touch upon the Fantasy World. I once drew a quite elaborate map of Icaria, but that's for a later day. For more information, see the Zeno Narrative, which has been reprinted by the Haklyut Society. Ramsay mentions Atlantic Crossings Before Columbus by Frederick Pohl, Farley Mowat's Westviking, and Charles Boland's They All Discovered America. Books after Ramsay that touch upon similar subjects are Barry Fell's America BC and Jim Brandon's Weird America. Breasil, Brassil, Brazil, Hi-Brasil, or O'Breasil, had nothing to do with the South American country of similar name; the words don't even have similar origins. Breasil appeared on maps as an almost perfectly circular island just to the west of southern Ireland. It was much the same as Avalon or Tir-Na-nOg, the Blessed Isles of the Celts, but people claimed to have seen it and even landed on it, as recently as 1674 when John Nisbet, an Irish sea captain put into Killibega Harbor. "Breasil was a great black rock, inhabited by great black rabbits, and by a wicked wizard who dwelt in a strong castle." [p. 91] No one believed him, despite the testimony of several Scottish castaways he had rescued along the way. From here the accounts of the "phantom islands" off the coast of Ireland would be good; see The Story of the Irish Race by Macmanus and Peter Haining's The Leprechaun's Kingdom. Jumping forward in time from Ramsay, we'd certainly include Tim Severin's The Brendan Voyage. Chapter Five of Ramsey covers a number of miscellaneous islands. "Antillia" first appeared on a map in 1367 approximately where the Azores are located -- though the Azores had not been discovered yet. On Ballista Beccario's map of 1435 it is a rectangular island far west of Spain, accompanied by three islets: Reylla, Salvagio, and Isle in Mar. The vertical rectangle shape of the island remained; there is reason to believe it was actually Cuba, turned on its side, so to speak, due to map distortions or bad reporting. (See Maps of the Ancient Sea Kings). Maps and letters of the 15th century mention it as if it were a well known shipping hazard. Perhaps we've lost some document along the way. It became confused with the Island of the Seven Cities, and we might keep the name for that. As an added bonus, a 1508 map gives the name "Antiglia" for the area that is now Venezuela. "The Aurora Islands" were three small islands southeast of the Falklands, first spotted from the Spanish ship Aurora in 1762, then by the San Miguel (which gave their position as 52 d. 37m. S., 47 d. 49 m. W.) They were sighted from the Aurora again in 1774. The northernmost island was a snow-covered peak, the central was largest and "tent-shaped", the southernmost was saddle-shaped. Ships could not find them in 1820 and 1822. They were last reported by the Helen Baird in 1856 at Lat. 52 d. 42 m. S and long. 48 d. 22 m. W. They featured in Poe's Arthur Gordon Pym and were written of by Rupert T. Gould in Oddities. "Daculi" appeared only on maps; no one is known to have "sighted" it. It was nearly always located north of Breasil, northwest of Ireland, and west of Barra in the Hebrides. A Latin inscription on one map suggests that pregnant women "who have difficulty in delivery will give birth easily if taken over to Daculi." [Ramsey, p. 101] In the Other World this might be its function -- no doubt there is a temple to the Mother Goddess there. It disappeared from maps by 1500. In 1687 a doctor/surgeon/adventurer named Lionel Wafer was sailing with Dutch pirate John Davis aboard the Bachelor's Delight. While sailing south in the Pacific, the ship was shaken by an undersea earthquake. At about 20 degrees 27 minutes south the men spotted an island approximately 40 to 45 miles in length. It was christened "Davis Land." Flocks of birds rose from it as they passed, so it could not have been simply a cloudbank. No one else ever sighted it. See The Riddle of the Pacific by J. Macmillan Brown. "Dougherty Island," a spot of land "with many seals and sea birds," was first reported by a Captain Swain of Nantucket in 1800 at 59 d. S. 90 to 100 d. W. It was reported off and on for several more decades, at 59 degrees S., but varying wildly between 90 to 120 degrees W. (Perhaps it was a string of islands.) Captain Dougherty of the James Stewart, after whom it was named, put it at 120 d. 20 m. W., writing that it was 5 or 6 miles long, with a bluff at the northeast end that curved down into flat land. Ships reported it until 1889 -- then it vanished. Soundings made by Robert Scott (of the Antarctic!) in 1904 indicated a depth of 2558 fathoms here! It remained on atlases into the 1930s. A Spanish captain named Antonio de la Roche reported "a very large and pleasant island, with a good harbor to the eastward" in 1675, which he christened "Isla Grande." It lay at 45 degrees south, and somewhere east of Argentina. Later ships thoroughly scoured the area without locating it. A Dutch captain named Lindeman reported "Saxemberg Island" in 1670 at about 30 d. 40 m. S, 19 d. 31 m. W. It was a low-lying island with a single, startlingly high peak at the center, giving it the appearance of the cliché witch's hat. For over a century it was no more but a myth, but in 1804 Captain Galloway of the Fanny had it in view for four hours. Captain Head of the True Briton outdid that by observing it for six hours in 1816. It has not been seen since, however. Which is to say, certain old books speaking of "islands" actually mean a remote region of the mainland. In fact, Ramsey could not find a use of the word "island" as a small area of land completely surrounded by water before 1555. Anyway, this leads to "La Man Satanaxio" (which might mean "Hand of Satan"), which was shown on 15th century maps about where Nova Scotia should be. Whatever "Satanaxio" meant, it became "Insulae Demonium," the Isle of Demons, by the 16th century, and it was usually located off the coast of Newfoundland or Labrador. Johnson's book (which we will reach later) elaborates greatly on this -- including the tidbit that gryphons were among the creatures dwelling there. Ramsey mentions in passing "Skuggifjord", the opening at the edge of the world through which, the Norse believed, the Atlantic flowed in and out, making the tides. See Farley Mowat's Westviking. Much of Chapter Five comes from William Babcock's Legendary Islands of the Atlantic. Another good source (written after Ramsay) is Phantom Islands of the Atlantic by Donald S. Johnson. Chester: Wow! Now we're getting down to business. Where, even, to begin? I guess what interests me as much as what you think should be on our fantasy map is what you sort of dismiss, like St. Brendan and the Zeno Narrative. Why do you gloss over them? M: I struggled with the Zeno story a long time, but most of the apparently fantastic islands turned out to be real. The Zeno brothers had no trouble sending letters to Italy or sailing from there up to "Frisland". "Engroenland" is just an old name for Greenland. Their trip to the west might have been an actual pre-Columbian landing in America -- it would account for the Scottish Knight carving. The fisherman's story -- of "Estotiland" and "Drogeo" -- are just too vague, given at third or fourth hand, and over centuries at that. "Icaria" sounds interesting -- as a real place on this earth that might have sunk. There are stories here, but not for an Other World. Similarly, St. Brendan might be another pre-Columbian visitor. There's the line of thought that he inspired Kukulkan and Quetzalcoatl, the bearded gods of Central America. C: So you're saving some mysteries and legends for this world, so to speak. M: Mainly because it didn't seem logical to say, for instance, the Zenos had weird adventures in unknown places, and then they met a fisherman who popped in and out of a parallel world. C: But some very vague "sightings" you count as views of the Other World. M: We'll have to assume that some unknown natural phenomenon allows people to see, briefly, into the parallel world. Sailors glimpsed San Borodon, Davis Land, and the like, but when other ships sailed looking for them the window of opportunity closed. I particularly like when a place has been dismissed as an illusion, then someone not only sees it, he lands on it! C: Like Breasil with its giant black rabbits? M: We'll see another story like that, for the Island of the Seven Cities. As an aside, we might refer to the island west of Ireland as "Hy-Breasil" just to make it look even less like "Brazil". C: Can do! So, now, besides the Southern Continent and the Eurasia-like Sakria, we have a scattering of islands on the Fantasy World: most in the Atlantic (or its equivalent), but at least one, Davis Land, in the Pacific. M: And we might note that the inhabitants of the Secondary World certainly don't call these places by the names of earthly ship captains. Hy-Breasil may be a name used there, but not Dougherty Island. C: Details we'll have to watch for as we actually draw our maps. No Longer on the Map, Chapter Six, starts with the invasion of Spain in the year 711 by Moors under Jebal al-Tariq. King Rodrigo of Spain was killed and his forces defeated, and all the Christian population fled before the invaders. According to legend, seven Portuguese bishops sailed off with a number of people from their dioceses to an unknown island, where they founded seven cities. Coronado, in search of Cibola, found the Grand Canyon but little else. His Indian guide, “Turk”, spoke of his homeland "Quivera" (key-veer-a), to the northeast, where there ran a river two leagues wide, complete with galleys with forty oars, fish the size of horses, and other wonders. It was a complete lie to weaken the Spaniards. Back to the Seven Cities: In 1639 a group of Franciscans sailed from Madeira and were blown off-course. After a day’s sailing (direction not given), they landed on a strange island with a large, sparcely-inhabited city, a circular palace, a lighthouse, and a chapel guarded by lions. The king of the island was called the Majestic Ancient. A couple of other expeditions were rumored to have landed on an island where the people spoke Portuguese and asked if the Moors still held Portugal. As mentioned earlier, the Island of the Seven Cities is sometimes identified as Antillia; I believe I'll keep the name. It may be the same as San Borodon. Back to California: In 1542, Rodriguez de Cabrillo explored the California coast. He and his men sailed almost to Oregon and wintered on San Miguel Island. Cabrillo died, but his second-in-command continued. From the Indians of Santa Barbara the second heard about men with beards on the mainland. Somehow this became Quivera again (or "Xaquivira", as Antonio Galvano called it). In fact, it blossomed into a complex geography. Quivera was a Pacific coast empire. Its capital, also called Quivera, sat at the mouth of a river; on the same river, farther inland, sat the city of "Tuchano". "Axa" and "Cicuic" were two other large communities. To the south, at about the latitude of Cape Mendocino, lay another country, "Tiguex". Ortelius’ map makes Quivera an “ugly bulge” on the US west coast. Its southern boundary is a river leading to “Pinnace Bay,” with a land called "Tolm", containing Cicuic, south of that. Then comes Totoneac, where Axa and Tiguex lie. Chester: Chapter Six jumps back and forth, doesn’t it? M: The theme of “seven cities” seemed to be a favorite in the explorers’ psyche. C: Looks like we’re expanding the North American arena, with several countries in the west. M: Cibola might be in Totoneac, which is near the Arizona-New Mexico border. Since the earth and the Other World don’t match geographically, Quivera might as well be a “bulge” out into the Pacific, about where Cape Mendocino lies, and with it are countries called Tiguex and Tolm. The other names are cities within those kingdoms. C: May have too many “T”s there, but we’ll fill in more lands around them, right? C: Now, you just said Earth and the Other World don’t match geographically, but it seems we’re creating a North America-type continent, a Eurasia, and an Antarctic. M: They only approximately overlap. There will be plenty of islands with no earthly equivalent, and seas where we have land. Unfortunately, most myths and legends come from people on dry land, so they would not be in a position to “see” countries out in the ocean. Ramsey’s book is so important because it collects most of the geographic legends of maps and explorers and sailors. C: We got a dab of the Seven Cities of the Atlantic, too. M: The rumors of Portuguese refugees building on an island were just that – rumors, built upon wishful thinking. Then along comes that 1639 report of finding an island that might have something to do with it. The full story is creepy and Twilight-Zone-ish, with its strange buildings and nearly empty city, a complete anomaly. C: And we’ll say they sailed briefly into another dimension and found Antillia or San Borodon, right? Chapter Seven tells us that in the sixteenth century, England and France had difficulty with trade: Spain controlled the Straits of Magellan, Portugal controlled Cape Horn, and the Turks controlled the overland route to Asia. Thus the idea of a "Northwest Passage" around Canada rose from wishful thinking. Marco Polo mentioned a land called "Anian" at the far extremity of Asia; beyond that lay "Toloman" about where Alaska should be. By the sixteenth century the "Strait of Anian" appeared on maps, between Asia and North America. As late as 1850, Arctic explorer Elisha Kent Kane reached the northwestern tip of Greenland and saw from the cliffs “open water, with heavy breakers and no ice whatever.” He believed that there were two “poles of cold” at 80 degrees north, and that at the pole it was actually warm! Such a concept might explain Hyperborea, of which we’ll hear more later. Chapter Eight: The name "Norumbega" became attached to a large chunk of North America in the New England area, first appearing on maps in 1529. No one knows where the name came from or what it means. At first it was a large river, but by the 1540s it was an extensive country. The French explorer Jacques Cartier sailed up the St. Lawrence river in 1534. He didn’t mention Norumbega, but he claimed to have found an Indian nation called "Hochelaga" about where Quebec is now. On his 1541-42 expedition, however, Cartier passed the “Cape of Norembegue” (Cape Cod), and the “River of Norumbegue” (the Narragansett). We are told that there was a city of Norumbega forty miles inland, with “good people” who had many animal pelts. Eventually Norumbega became the Nova Scotia-New Brunswick-Maine area, and Hochelaga got pushed to Chicago. Chapter Nine: Plutarch, in the 1st Century A.D., wrote The Face in the Moon, in which he stated that the Britons spoke of an island to the west called something like "Cronos". (Ramsey points out that in Gaelic it would have been pronounced “Pronos”.) This tied into the ancient Greek legend of Kronos the Titan being exiled to an island in the west by Zeus. Perhaps it ties into the “Cronian Sea,” which we will hear about shortly. Chapter Ten: "Mayda" first appeared on the 1367 map of the Pizigani brothers. For the next century it was called “Mam” or “Man”. Other maps called it "Onzele" or "Bentusla", and some gave it no name at all – which was usually done for definitely existing islands that might prove hazardous to shipping. Whatever it was called, Mayda was normally drawn as a crescent shape (the horns pointing north), west of Brittany, southwest of Ireland, and due south of Hy-Breasil. From 1553 onward the island was called Mayda, Maida, or Maidas. On August 22, 1948, at 46 degrees 23 minutes north, 37 degrees 20 minutes west, the freighter American Scientist found a sonar reading of 20 fathoms where the charts read 2400 fathoms. They returned to the site and eventually outlined an area 28 miles in diameter that was only 15 to 35 fathoms down, while everywhere beyond dropped to the usual deeps. Their radio reports were picked up by the Southland, which also measured the area and found a “bay” on the north side, 90 fathoms deep. Therefore Mayda might have been an actual case of a sinking island. Chapter Eleven: One detail that proved bothersome in the Greek myth of Jason and the Argonauts was the idea that the Argo left the Black Sea in a different direction from where it had come. “Pseudo-Orpheus” (4th Century A.D.) said they sailed north through a channel called the "Phasis" to the "Cronian Sea," then west around Oceanus to the Mediterranean. At the joining of Phasis and the Cronian Sea lay the "Rhipaean Mountains." In 1818 Commander John Ross of the Royal Navy sought the Northwest Passage. He discovered a landmass he named Baffin Island, and he thought that Lancaster Sound might be the Passage. However, he gave up after searching it a single day. The Sound, he reported, was cut off to the west by a vast mountain chain he named the "Crocker Mountains." A new expedition under William Parry, a year later, sailed farther west than the supposed mountains, so they were dismissed as an optical illusion. In 1906, Robert E. Peary reached 86 degrees north. He spotted land in the distance beyond the pack ice, with towering peaks, northwest of Ellesmere Land. He named it "Crocker Land." Donald MacMillan’s 1914 expedition did not find them – but he spotted mountains 200 miles farther west. “Crocker Land” appears to exist as a shifting mirage – but where is the original of the mirage? Chester: Whew! We’re finally through with No Longer on the Map! M: Now we have enough areas and names to begin an actual atlas of the Secondary World. Some areas actually match up, now: We can say that the equivalent of the Arctic Ocean must be the Cronian Sea (cool name! ), and that somewhere in the far north must be the island of Kronos. The Anian Strait separates Sakria from Toloman, serving as the equivalent of the Bering Sea. C: Norumbega and Hochelaga now give us some names for the eastern part of the quasi-North America. M: Right! Mayda, on the other hand, may be a land of this earth. But it was always due south of Hy-Breasil, so now we know that island lies at 37 degrees 20 minutes west, at the same latitude as Ireland. C: Our fantasy world so far has come from a handful of sources: Children’s Crusade, Curious Myths of the Middle Ages, No Longer on the Map, The Black Death, The Dancing Mania pamphlet, and a few other odds and ends. M: I have thought of them as the main inspirations, but almost any book in my library might contribute something. C: So how many books do you have? M: I must be close to 4,000 now. C: And you want to check all of them?! M: Plus my thousand or so magazines, numerous Xeroxes and newspaper clippings, and items in books I don’t own. C: Ai Carumba! But half your books are fiction, and you said you weren’t “crossing over” into any other universes. M: Well, we need to absorb all those works and be heartened by the great writers (and weed out the not-so-great). Not only fantasy and SF, either, but historicals, classics, romances – everything. C: *Whew*! Well, guess we’d better get down to cases! On to The Aristeas Factor. Back to Page One of the FWP.